Today I’m going to exercise my right as half-owner of this blog to selfishly make some sweeping observations about modern and traditional church aesthetics. Absolutely riveting, right?? I probably spend more time than most folks thinking about this sort of thing and what I really hope to do is get some discussion started. Please comment! Modern Church: Contemporary music, flexible worship spaces (movable seating, etc. ), prominent audio/visual systems, casual style and feel. Think “non-denominational mega church” and I’m 90% confident you’re mind’s eye will get you there. Traditional Church: Traditional music, (sometimes) ancient worship space design, dressy style and feel. Often these churches are more liturgical than their modern contemporaries. Think “cathedral” or “chapel”. In thinking about these two paradigms it became apparent to me there are two themes that each style of church has championed over the years. Modern churches, perhaps above all else, strive for an inviting atmosphere. Traditional churches, on the other hand, have pushed hard to maintain reverence and have resisted changing many of their practices and spaces in an effort to hold onto that archetype. Having held membership at an older church that tried to “follow the times” and having visited several modern churches pretty heavily over the last few years, here’s what I’ve observed about Modern, welcome-focused churches. Attendees are encouraged to “come as you are” (dress casually), grab a cup of joe, take notes on your iPhone, etc. You’ll be hard-pressed to find a modern church that doesn’t begin to invest heavily into their audio/video systems. I’ve been playing in rock bands for 12 years and have yet to play at a club that had better lights and sound than most of the modern churches I’ve been to. Modern churches tend to assume that visitors are not yet Christians. Sermons are often geared toward, or end with, an attempt at evangelism. There’s been a movement to disassociate church bodies from “things of the past” – to the point of adopting a new way of naming churches (often even avoiding use of the word “church” altogether) and their employees’ titles. Musically, modern churches exclusively utilize selections from Contemporary Christian and Praise & Worship genres, ranging from small acoustic guitar-centric ensembles to full on rock bands. Most of the music and arrangements performed is a maximum of 20-30 years old, though often you will hear new arrangements of older hymns. During college, I joined a traditional church and have remained there since. I may be the pot calling the kettle black, but I’ll try to give some objective thoughts. I feel that hard-and-fast rules are probably waning, but people generally dress up for church, put their phones away, and save caffeination for fellowship afterwards. People generally read from real books and paper materials. Worship spaces are decorated with stone and wood and sometimes icons (stained glass, etc.) of Biblical scenes. 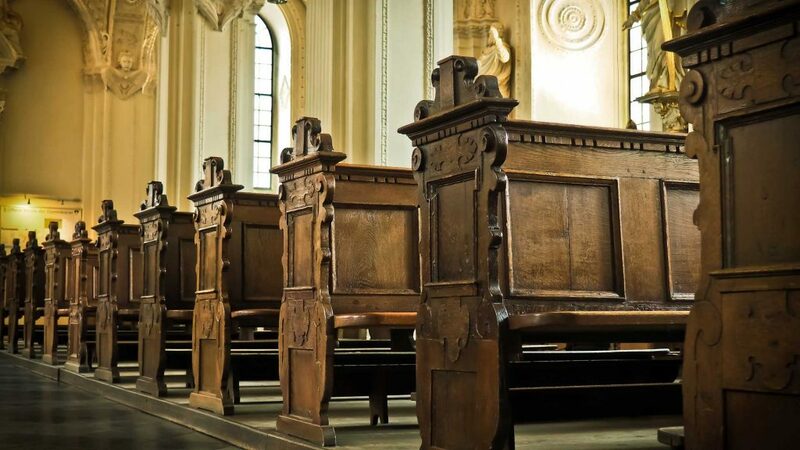 Traditional, especially liturgical churches, assume that attendees are Christians. Sermons and teaching are generally geared toward the edification of those who already believe the Gospel. Old fashioned churches generally seem to adhere to a policy of “if it ain’t broke, don’t fix it” when it comes to keeping up with the times. Traditional church music is generally selected from published hymnals, with selections dating anywhere from 50-500 years old. Newer music is not often adopted for congregational worship, though sometimes may be selected for choir/ensemble performance. At the risk of providing a cop-out answer, I’ll go ahead state that I think we have a lot to learn from each other. You’ll find scriptural support for both styles of church. Modernists would cite the Great Commission (Matthew 28:16-20) as the basis for most of their decisions, and there is certainly something admirable about the idea of laying down everything for the sake of making new disciples. They have shed the ways of olde because those ways “feel weird” to people who aren’t professing Christians. Creating an environment that feels, aesthetically, like a corporate motivational conference book-ended with a light rock concert meets people, almost literally, exactly where they are. And, quite frankly, it’s effective. Contrarily, traditionalists would cite scriptures like Matthew 7:13-14 (“Enter by the narrow gate…”) and point out that many ancient Christian traditions can be traced to the Judaism of our ancestors. They’d point out that participating in the same rites that the universal church has honored for many generations ties us in a more powerful way to the saints who have gone before us, paving the way for a more holistic view of Christianity. So where do I stand? Well, I’m definitely not in favor of the “us vs. them” attitude I find at nearly every church on either side of the pew. Good and bad Christians will be found in all churches and I don’t think I believe that aesthetics have much to do with that – God will move in the ways He wishes. I am admittedly attracted to traditional forms of worship. Maybe above all, they make me feel more connected to the whole of Christianity. When I go to church on Sundays, I love the feeling that there are congregations all over the world participating in a nearly-identical service and that those churches have been doing that for hundreds of years. That said, I truly admire the contemporary movement for recognizing that traditional churches and denominations have failed pretty miserably at reaching the last couple of generations. Heck, nowadays many of those groups can barely seem to figure out who or what they are, let alone figure out how to spread the Gospel. In my ideal world, we’d blend the strengths of both. We’d work hard to remember who we are and continue in the traditions that make us that, but we’d recognize the massive worldwide contemporary cultural shifts away from Christianity (or religion as a whole) and rise to meet that challenge. God is giving His people the gift of opportunity. Christianity can and should no longer be assumed. Let us not change ourselves or meet the world halfway down the aisle. Instead, let us walk all the way over and show them what we’ve been given. I guess I lean toward Traditional with recognition of Modern elements and components. My current pastor pulled out an iPhone during his sermon and read from it. The younger folks loved it and thought it was very cool. I think both Traditional and Modern have the capacity to share with each other.